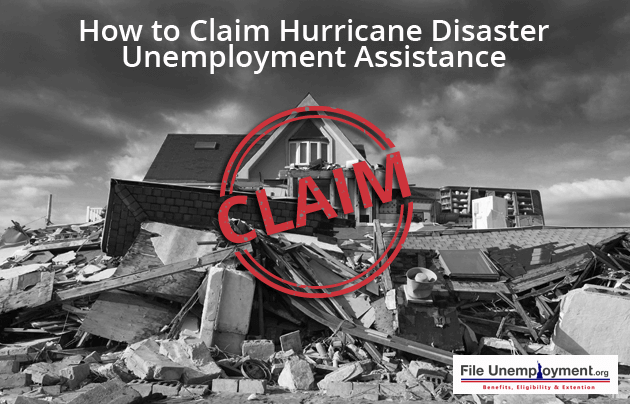 How to Claim Hurricane Disaster Unemployment Assistance? If you are a victim of the storm, then you should avail for Disaster Unemployment Assistance to help you through this troubled time. Disaster Unemployment Assistance (DUA) aims at assisting individuals with unemployment benefits that have lost their jobs or are no longer working due to a major disaster in an area where a disaster assistance period is declared. This is available to those that have applied but are not eligible for regular unemployment benefits. The previous job contributed to more than 50% of your total income. Stay, work and travel in the disaster area. Your office, place of employment is damaged or closed. Scheduled to start work which does not exist or no longer reach due to the storm. You are the breadwinner of the household because of the death of the head of the household. DUA is available for people during the Disaster Assistance period which starts on the first Sunday from when the major disaster has been declared. Usually, the Federal Emergency Management Agency (FEMA) and the DUA regulations define when the period starts and finishes. Seasonal workers are eligible for DUA if they would have been employed when the disaster had occurred. How Do You Apply for DUA? There are two options that eligible candidates can use to get the benefits of DUA. They can apply online at the Unemployment Benefit Services by clicking on the ‘Apply for Benefits’ option. They can also call the Tele-Center at 800-939-6631 to speak to a customer service representative. Those from Louisiana can call 225-925-7500. Those that are eligible will receive information on their weekly benefit amount, how to ask for payments and receive a copy of the Unemployment Benefits Handbook. In order to ensure that you can claim your benefits, you should complete your work search registration within 3 days of your application for the DUA. This is unless you have an intention to restart your business and if you are otherwise self-employed and looking to reopen your business. The proof of your employment which was disrupted by the disaster must be submitted within 21 days of the application. Work searches may be exempt in the disaster-hit regions in case it takes more than 12 weeks to restart the operations. Finally, you should request payment of DUA with the Payment Request sent to you and ensure that your mailing address is correct to receive your benefits. The minimum DUA weekly benefit amount is at least 50% of the state average WBA (Weekly Benefit Amount). For example, if you receive a WBA of $315, you should then be eligible for a DUA of $157. Minimum weekly benefits are used if you do not have any base period wages or enough wages to receive a minimum required benefit amount. Benefit amount reductions would be based on working part-time and your WBA will be reduced in proportion to the number of hours worked. All 39 Texas counties that are within the presidential disaster declaration have to apply until October 31. If you file after the deadline then it may be denied unless there is a good cause. All applicants should submit their Social Security Number, check stubs and documentation to support the claim that they are working or self-employed. How Much DUA Benefits Payments? To enroll in DUA, victims of the disaster should apply within 30 days after the availability is announced. Other applications would only be accepted for a “good cause” and in no case can the DUA application be received after the disaster period ends. You are required to provide supporting documents of your employment and earnings with your Social Security Number. If you are self-employed, you should provide your tax return copies. If you are employed, documents that provide proof of employment should be furnished. You should also provide a sworn statement which includes verification forms. By failing to do so, it would result in benefit overpayment which would be collected by the state. Each state will process the DUA differently. Most states may do so via internet and telephone. But if you are affected by Hurricane Irma, you should check periodically on the state websites. Open these websites if you have applied at Florida, Georgia, Puerto Rico, and U.S. Virgin Islands unemployment insurance agency websites listed below. Do state unemployment benefits apply to agricultural workers? Farmworkers are eligible for benefits from the state. In Florida, those agricultural employers with more than 5 employees over a 20 week period or paid $10,000 in wages in a calendar quarter must cover these workers. In Texas, workers are covered if they employ at least 3 employees for 20 weeks or paid at least $6250 in wages during the calendar quarter. If a farmer fails to qualify then they should submit their application for Disaster Unemployment Assistance (DUA). Do immigrant workers get state unemployment benefits and DUA? Workers that provide work authorization when they are working or when they collect benefits can qualify for unemployment benefits and DUA. Those that are not US citizens should provide the necessary documentation that supports their immigration status and the State UI agency should verify the same. Their status is usually verified through a process called Systematic Alien Verification For Entitlement Program by the US Citizenship and Immigration Services.